Help! Police! Zionists Are Looking At Us! 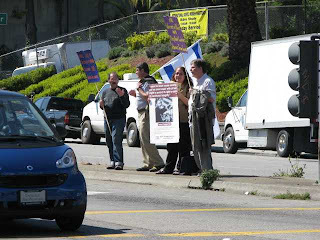 When Bay Area Women in Black (BAWIB) decided to do anti-Israel vigils at the corner of Grand and Lake in April of 2007, San Francisco Voice For Israel knew that we had to come and counter. As we stood with them that day, April 7th, 2007, they started what became a recurring theme. They called the police. Oakland Police sent tactical negotiator Sgt. Hookfin (badge #276) came to deal with the situation. He told us that BAWIB felt threatened by our presence and he demanded that we separate the groups. If we did not, he stated, we would not be having as nice a conversation as we were having at that moment. His initial suggestion was for us to stand in front of the Kentucky Fried Chicken on the next block. This was unacceptable to us. What we did agree at the time was to stand on opposite corners of Grand and Lake, alternating the corners weekly. Since that time, BAWIB have called the police repeatedly, both in Oakland and in San Francisco. The most notorious incident was when they called the police on Rabbi Bloom and his contingent from Temple Beth Abraham because they crossed by where BAWIB were standing on their way back to their synagogue. With their attempts at harassment failing to deter our presence, they turned to a new tack, facing away from us. On February 9, 2008, instead of facing the Grand Lake Theatre, they decided to face towards Grand Avenue. Adapting to their new strategy, we came up with a new one of our own, we stood on the median island on Grand Ave. We had previously stood there once before, on December 1st, 2007 that would have been without incident had not Felice of BAWIB not come to collect a flyer from us and she was followed by a notoriously hostile and violent BAWIB activist, Ms. Stoller to harass us. In February, BAWIB decided that our standing in the median, separated from them by 4 lanes of traffic was somehow “violating the agreement,” and furthermore, illegal. They threatened to call the police. On each occasion that BAWIB stood on the corner with the Farmer’s Market, a couple people stood in the median island. No incidents stemmed from this until March 22nd. Apparently, they had called the police 2 weeks ago for the same reason but by the time police arrived, both groups had gone. It is Oakland, after all, and police have better things to do than rush over at the whim of someone feeling threatened by 3 people standing on a median looking at them. On March 22nd, Sgt. Hookfin arrived in time and came over to talk to both groups. Now, rather than the agreement being about keeping the groups separated, BAWIB and Sgt. Hookfin claim it is about being on different corners. Now they claim they are threatened by us standing on a median island separated by only 4 lanes of heavy traffic. Sgt. Hookfin tried to suggest that it was like militarily “flanking” them by standing in the median. This time, we were in no mood for appeasement. We have already appeased them several times. We have changed our flyers when they complained, we allowed ourselves to be separated from them. We try to keep our people from interacting with them. We have allowed them to interact with us without calling police. We have allowed them to pass by us multiple times as they bring materials back and forth from their vehicles. This time, we felt that we no longer had any reason to appease. We agree to separation. We did not agree to stay off the median. BAWIB representatives Sharon, Felice, and Ron Klein (who had previously given his name as Ralph) adamantly refused and said this could void the agreement. Felice even yelled at me for filming the conversation. Sharon tried to yell that her son was a police officer who refused to work on Shabbat. After BAWIB stormed off, we did agree with Sgt. Hookfin to allow whoever got to the median first to have exclusive use of it. We fully expect BAWIB to object, but clearly their issues are not about their feeling “threatened” as separation should have dealt with that and they no longer even feel an agreement is needed for their safety. Their issue is in a countering message being present. This is the reason for the harassment, for the continual calling of the police and for wasting an hour of police time to attempt to muzzle our counter-protest. Given that the Women in Black once called the cops on a crippled middle-aged lawyer who even with a cane could only stumble along painfully (and brings her own folding chair to rallies), it is not surprising that four mild and innocuous people on the other side of three busy lanes of traffic would be perceived as dangerous and threatening. We're like radioctive material - once critical mass is reached (probably with the addition of one more person), who knows what we will do. What is the current status of the OPD's harassment of San Francisco Voice For Israel ?? Are counter-protests against BAWIB still happening ?? FWIW, Summertime is nigh, and with the better weather, one could possibly expect more local passers-by. OPD were not harassing us per say, but being used as unwitting tools of BAWIB’s harassment campaign. Here is the latest update. I had a full discussion on the issue with a higher up in the OPD. The district captain was supposed to contact me if there were any further issues, but he never did. At the time of this writing, it appears that BAWIB have at least suspended their use of OPD to harass us and the OPD, so I am told, have been made fully aware of BAWIB’s agenda. San Francisco Voice for Israel will have a booth at Israel in the Gardens and will be the lead coordinator of the counter-protest against the anti-Israel protestors at Israel in the Garden on Sunday, June 1st. Oh, and yes, we are still counter-protesting BAWIB. As long as they keeep fighting, we need to keep fighting back.